As the public becomes more aware of how important dental health is, it is crucial to ensure you are trusting your smile to a dentist that is confident in their skills! A great dentist will have no trouble making you feel at ease and comfortable when you’re in the dental chair. In order to help you find a dentist that is a good fit, we’ve compiled a list of tips to ensure you make the best choice for you and your family. Word of mouth is undoubtedly one of the largest factors in finding a dentist that is right for you. Taking some experiences of other individuals who have seen the same dentist into consideration is crucial in making your own decision! For convenience sake, most research can be done online alone. You may be surprised at just how many people online share their experiences, good and bad, for others to read! Within seconds following a Google search, you have access to hundreds of reviews written by other people who have shared experiences with the dentist you are interested in starting treatment with. While everyone has different experiences, it is a good idea to conduct some research online to get a general idea of what you can expect during your visit. The very first visit you schedule with a dentist you are interested in beginning treatment with should be an initial consultation. At Spring Dental, we offer a $19 dental exam that includes all x-rays and a consultation with our dentist. During this consultation appointment, no work will be done without first addressing your needs and budget. The dentist will examine your x-rays and conduct an oral exam in order to determine what type of treatment plan they recommend for you. 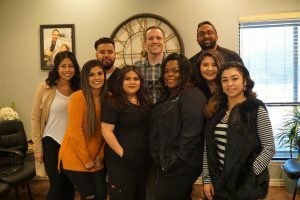 This initial visit gives you an excellent opportunity to discuss your wants and needs with the dentist, and allows you to get a feel for how you interact with them on a personable level. This is also a great time to ask any and all questions that you may have about your treatment, and what you can expect as a patient! Spring Dental also offers same-day treatment, so you don’t have to worry about missing work or scheduling multiple appointments. For many people, cost plays a large role in choosing a dentist. Every dental office is different: while one office may offer payment plans, another may not. While one office may accept certain insurances, another office may not accept any insurance at all. Make sure that you are choosing a dentist that offers financial plans that work for you. At Spring Dental, we accept all insurances and can work with you on a payment plan that works well with your budget. The planning, preparation and research that goes into choosing a new dentist can be time consuming, but it is undoubtedly worth it in the long run. You can be sure you are trusting your smile and your dental health to a capable dental professional at Spring Dental. Call or text Spring Dental to schedule your appointment!